Foley is located in southwest Alabama in Baldwin County. It has a mayor/council form of government. Magnolia Springs Land Company. He persuaded the Louisville and Nashville Railroad to run a spur to the area by promising to pay for the crossties needed for the line. By 1905, the town was large enough to warrant a post office, and it incorporated in 1915. Foley was primarily a farming community, served by the L&N Railroad via a depot and warehouse for farm products, notably potatoes. Early businesses included a bottling company that produced a soft-drink called "Ski-Hi." The first newspaper, a weekly called The Onlooker, began publication in 1907. Foley’s population at the time of the 2010 Census was 14,618. Of that number, 77.1 percent identified themselves as white, 14.9 percent as African American, 3.6 percent as Hispanic, 1.9 percent as two or more races, 1.1 percent as Asian, 0.6 percent as Native American, and 0.1 percent as Native Hawaiian and Other Pacific Islander. The city's median household income was $41,221, and per capita income was $22,967. Schools in Foley are part of the Baldwin School District; the city has approximately 3,087 students and 241 teachers in two elementary, one intermediate, one middle, and one high school. There are two private schools with 197 students and 13 teachers. Foley is intersected by U.S. Highway 98 (east-west) and State Highway 59 (north-south). The Foley Municipal Airport is located three miles northwest of the city center and serves general aviation. Each November, Foley holds the three-day Heritage Harbor Days in Foley Heritage Park; during this celebration, Foley sends its 28-foot shrimp boat, the "Miss Foley," to another city along with food, crafts, and music representative of city's heritage. The exchange city reciprocates with a slice of its own culture and heritage. Past exchange cities include Maggie Valley, North Carolina; Ozark, Missouri; and Winchester, Tennessee, among others. The celebration has taken place since 2001 and includes live entertainment featuring local and national bands, dancers, storytellers, children's activities, food, and fireworks. The city also holds a Flower and Garden Extravaganza in April in Heritage Park, a downtown Halloween event, and an early December winter celebration. Foley has nine city parks with athletic fields for softball, baseball, and soccer, as well as basketball and tennis courts and two municipal swimming pools. The city also features a recently opened hiking and biking trail and a horse arena. 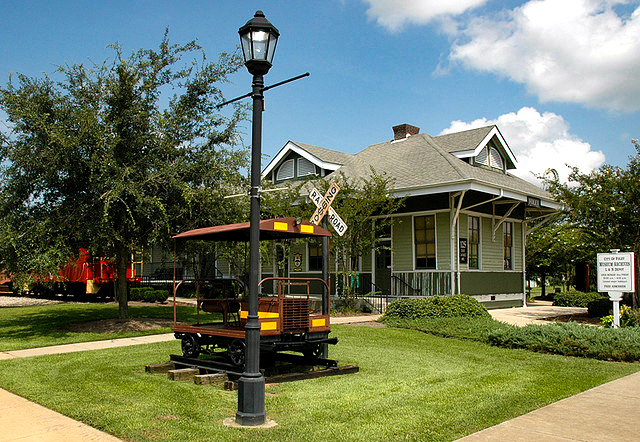 The Foley Depot Museum located in downtown Foley houses the city archives and history museum, as well as a model train exhibit. The Foley Downtown Historic District is listed on the National Register of Historic Places. Foley is a popular shopping destination, having one of the largest outlet malls in the state, the Tanger Outlet Center, which features approximately 120 brand-name outlet stores. Fly through the eye of a hurricane with “Hurricane Hunters” and our interactive display. Permanent exhibits, special exhibits, films and both adult and youth programs are offered throughout the year.. Located in Fairhope's 1928, Spanish Mission style City Hall, the museum includes the original Jail, Mayors Office, Town Council Chamber, and Fire Station out fitted with an original 1935 firetruck. Fairhope's colorful history is covered in many displays, featuring the 1894 Single Tax Colony and our Populist, Utopian founders. Hours, 9:00 - 5:00 Tue - Sat. Phone 251-929-1471. Learn about the role of Fort Gaines in the Battle of Mobile Bay, one of the Civil Wars most notable naval conflicts. Open daily from 9 a.m. - 5 p.m.
Today, Fort Morgan is a testament to the evolution of American coast defense and a history lesson waiting to be explored. Holmes Medical Museum is located in the first hospital in South Baldwin County from 1936-1958. Open M - F from 10 a.m. - 2 p.m. Free admission. We're in our 21st year of planning and conducting private bus trips for Convention, Business and Social Groups of fabulous Coastal Alabama!Tours showcasing Gulf of Mexico, Historic Mobile Bay and Tensaw Delta areas by Historic-Nature and Whimsy tours, of four hours or more. Just for the fun of it! hat make us mindful of the challenges and achievements in the early days of our fishing industry. A museum is a way of seeing. Exhibits tell a story with objects and images. The Baldwin County Heritage Museum is not filled with elaborate antiques or expensive collections – it holds bits and pieces collected from the daily lives of the men and women who built this county. BCHM represents the grass roots of our society. Over 20,000 square feet covering 5 acres provide a place for visitors to reconnect with the early history of Baldwin County. The museum believes that individuals who are allowed to reach out and touch the past will hold the future with greater care. Experience the heritage – and share the culture of Baldwin County.